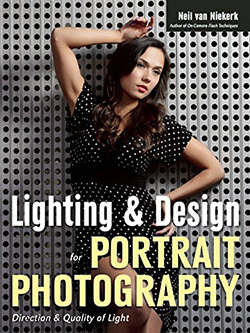 The use of video light for stills photography has become ever more popular in recent years, as high-ISO capable cameras made it possible to shoot in lower light without having to resort to flash. 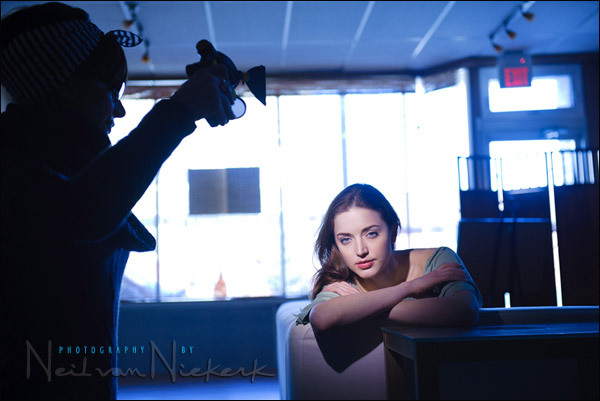 The immediacy of video light – the ‘wysiwyg’ nature of video light – makes it an interesting light source to play with and experiment with on a shoot. The dramatic quality of the light is also quite appealing. – video lights with an array of LEDs providing the light. – they are more compact. The Lowel ID-Light with a Besco battery and charger is approximately $450 but you can add more accessories like barndoors and handles. 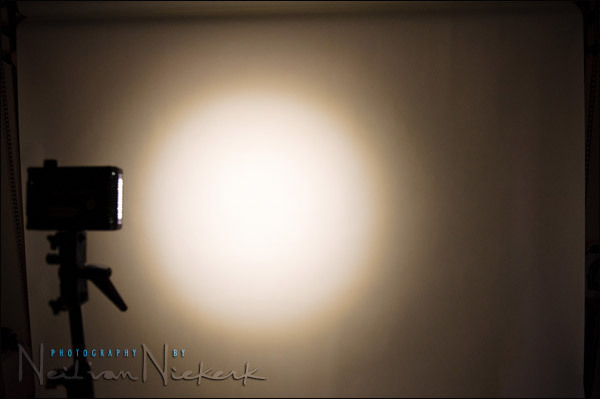 An LED video light can be anywhere from around $50 to $550 depending on your choice of brand, and what features it has. On paper the comparison isn’t an easy one to decipher. The Lowel ID-light is rated as giving a 100W output, but we can’t describe the LED lights in the same way with regards to their power consumption. There just isn’t that direct a correlation for an LED light in how much power it consumes vs how much light is emitted. The LED lights are far more efficient than Tungsten / Halogen lamps. The best you might see in a description is that a specific LED light gives an “equivalent to 50W” or such. This is why we’ll look at the actual metered output for these units. In testing these three units against each other, it was clear just how much brighter the Lowel ID-light is compared to the other units. The light is also focusable and has a dimmer. 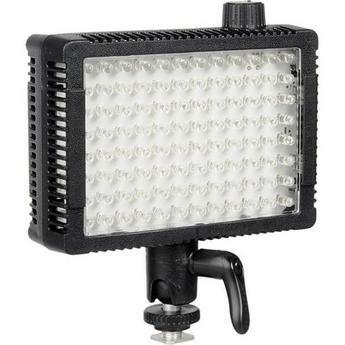 The LED video lights, with the exception of units like the Dedo Ledzilla, can’t have the light spread be focused. Having the ability to focus the spread of light from the Lowel ID-light, makes it a flexible option. 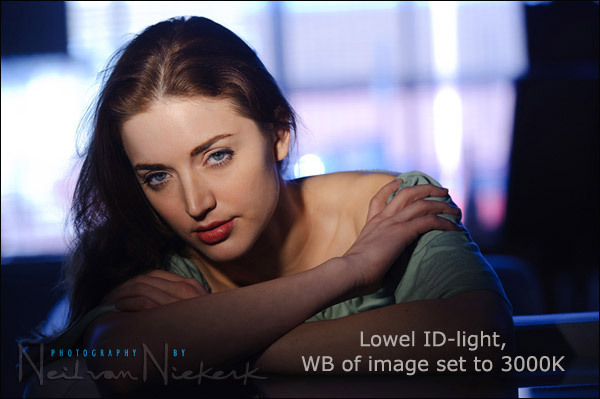 Since the Lowel ID-light is so much brighter than the other two units, it was easier to balance the subject against a brighter background. This gives you more leeway in terms of your camera settings, and how you want to light your subject in relation to the ambient light. What I like about these LED video lights, is that they are quite compact, and run on AA batteries. 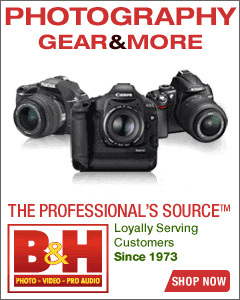 Easy to slip into a camera bag. I keep one in my main camera bag when I photograph weddings. I usually have the amber gel over it to gel it for Tungsten light. – it is less bright. Now we come to an interesting-looking video light. It looks quite futuristic. Even though it looks toy-like, it is anything but. 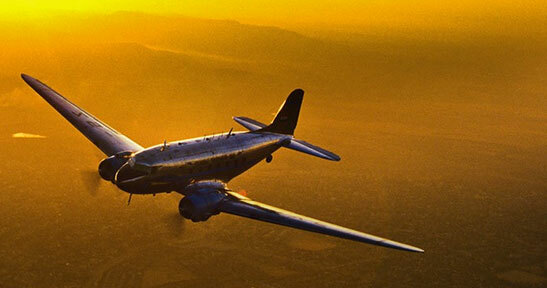 It is solidly engineered, and very well thought-out. There are barndoors on either side, and a diffuser and an amber gel that can be flipped in and out. It folds up into a fairly compact unit. Quite an elegant design! One of the things that set this apart from the other LED video lights that I’ve seen, is that the beam can be focused. 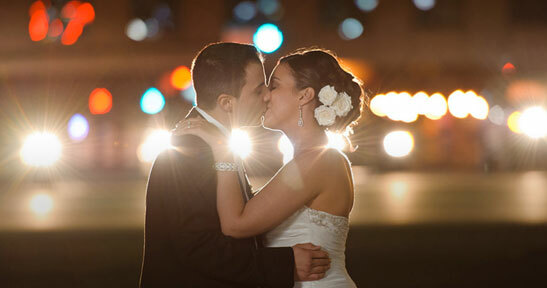 You’ll see in the series of photographs just how much it can be focused – a tight spot-light. Another bonus is that it can be powered from various sources, including Sony and Panasonic batteries. 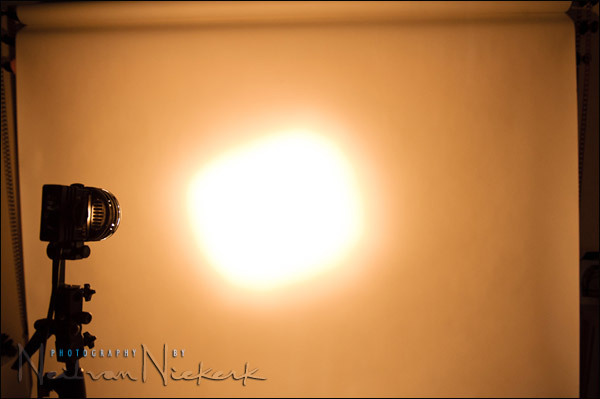 For those images, the LED lights had their respective gels over to match them with Tungsten light. I did pull in the color balance for each shot to have the skin tone look pleasant. However, in each pull-back shot you may have noticed the color balance being different from the others. 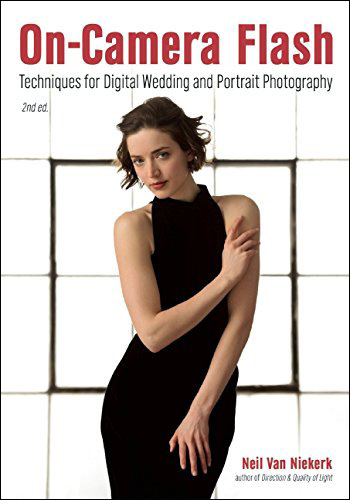 While you can fix the color balance as part of your normal RAW workflow, the actual color balance can make a difference if you’re shooting with other Tungsten balanced light sources. Here are the three portraits of Anelisa, with the WB set to 3000K in editing the RAW files. The Dedo Ledzilla has a noticable strong Magenta color cast. Simple enough to fix this in post-processing of the RAW file, as shown in the main photograph of Anelisa. But as mentioned, this may be a problem if this unit is used with other Incandescent light sources. The blue and purple colors you see in the background, coming in from behind Anelisa, is the daylight .. which is obviously a much cooler WB than the Tungsten balanced video lights. For these comparative shots, I set the camera on a tripod, and the video light on a sturdy light-stand. 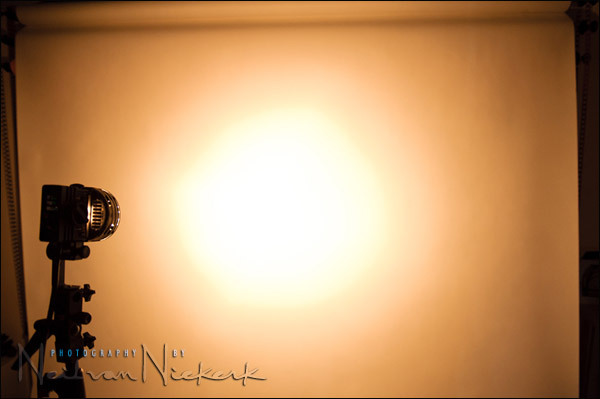 Then I photographed the light-spread against a white paper studio backdrop. 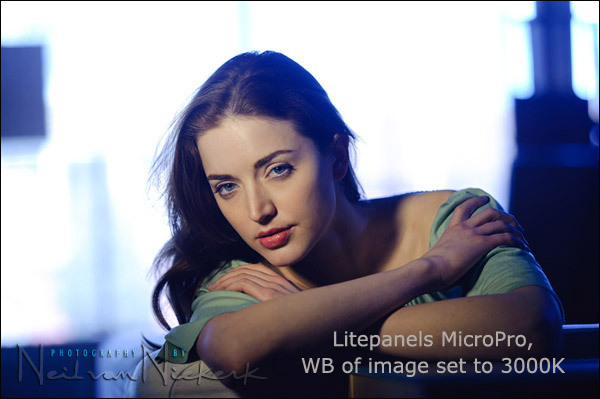 The LitePanels MicroPro .. a nice even spread without such a pronounced hot-spot in the middle like the Lowel ID-light. Adding the gel didn’t affect the spread of light in an appreciable way, so I’m just showing the spread of light without the gel here. The Dedo Ledzilla can be focused surprisingly wide and tight. The next three images is of the Dedo Ledzilla with the widest beam set, then adding the gel, and then adding the diffuser over the gel. The diffuser spreads the light very evenly, but with a penalty to the brightness. This compilation shows the widest spread, and the tightest spread … and two inbetween settings. All with the amber gel, and then the amber gel w/ diffuser panel. As you can see, the gel really dims the Dedo Ledzilla and with the diffuser panel over, it was outside the range the meter could read … and hence outside the range usable for me during a shoot. 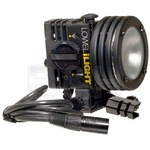 In terms of quantity of light and the way the light spreads, the Lowel ID-light outclasses the other two video lights. As mentioned though, the Litepanels MicroPro is my carry-with-me video light. It is compact and easy enough to fit into my camera bag. I can switch it on for long periods, and it doesn’t run hot. I can switch it off, and there’s no need to have it cool down first to put it back int my bag. 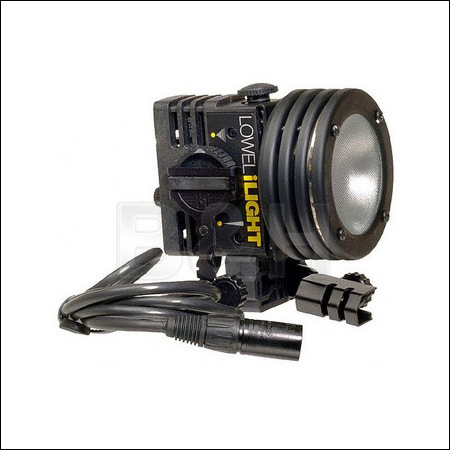 For a photo shoot where I have need of a video light, and have the opportunity and time to set up a light, for example with a boudoir photo session .. then the Lowel ID-light is my choice. While it does run hot, and the battery doesn’t last nearly as long as the batteries for an LED light, it is hard to beat for quantity and quality of light. Allen, nope, not pedantic at all. It was sloppy writing on my part. I’ve fixed the text now. For a particular style of images, I would like to give a bit more magenta tone to the skin for my portraits. As you already said, the Dedo Ledzilla video lights are having some magenta cast. I would love for you to review it and see what your thoughts are. Wow Neil, thanks for sharing in ways that even I could understand :) The trade-offs we make between ease of access and quantity / quality are a part of our everyday lives. Thank you for spelling it out. I too prefer the Lowel. Thorough review, thanks very much. @ Wayne, yes, I have the Comer 1800 and it’s brilliant. Very bright. 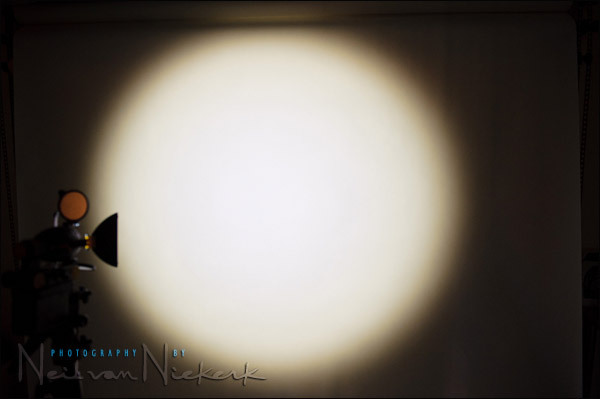 Have you used the Condenser ‘trick’ when ‘spotlighting’ of not closing it fully, leaving it open by half an inch [12-14mm] from fully closed to really concentrate the light more, great trick, throws the light even further. I do use my Lowell ID still under different circumstances, sometimes in conjunction with Comer just to give separation from background, or even giving different colour temps with Comer on a background from the Lowell for more dramatic looks. Wayne … I haven’t tried the Corner but it does look good there in comparison. I’ve been waiting so long for you to do this comparison.. thanks so much!! I have the Lowell ID and love using it but I’m really considering an LED one for traveling and other convenient reasons. – The Lightpanel MicroPro only has 96 LED lights. There are similar units (on ebay) which go up to 183 LED. Would those be twice as bright? – I think instead of using the plastic gel panel the companies provide, wouldn’t a rosco color correcting gel do the trick w/o cutting so much light? – The color from the Lowell blows the other 2 out of the water! Shahn … I would expect that there is a direct correlation between the number of LEDs and the brightness of the unit. And I think a Roscoe gel would work great too, but you’d have to tape it down. Less easy to flip in and out compared to the harder and thicker gel that the LED lights come with. 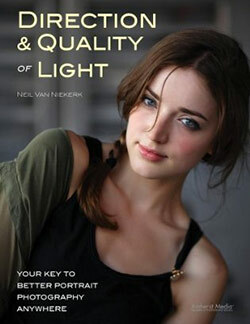 I want to do this test with my video light and, in some form, compare the results with yours. You can tell me what is the distance from the wall to the light as well as what are the levels of ambient light? Alfredo … unfortunately I didn’t take a specific measurement at the time, but I’d say I had the video light about 10 – 12 feet away from the paper backdrop. Nice comparison. I have tried using a 12 volt daylight balanced led replacement for the small tungsten downlights used in homes, slipped it into a short length of aluminium tube and capped the back and added a switch. I run it off a small 12 volt gel cell in a shoulder carry bag and it works great for a total cost under 100 bucks. I initially tried a 50 watt tungsten downlight which is a little brighter but runs very hot especially in my makeshift housing. But I am going to keep my DIY led and buy the lowel Id light as I want the barn doors and more light. I like the portability of led options but something about the tungsten lights just makes them more appealing to me, maybe its the nature of the fall off. Neil, great article as usual! I wonder if any on has used Doug Gordon’s Tourch Light. Anyone know how it stacks up to the Lowel ID. I love my ID but would love a LED with the same brightness with out the huge battery pack I carry around for my ID. Anyway, thanks again Neil! Very informative! Nice Article neil, but could please tell us at what distance you placed the video lights when you measured their brightness? thanks for the comparison. 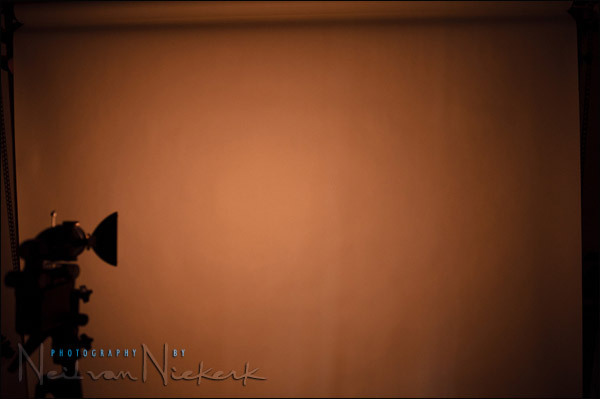 I have one qusetion: what is the distance between the video lights and the backdrop when you measured the brightness? gt and Nick… unfortunately I didn’t take a specific measurement at the time, but I’d say I had the video light about 10 – 12 feet away from the paper backdrop. 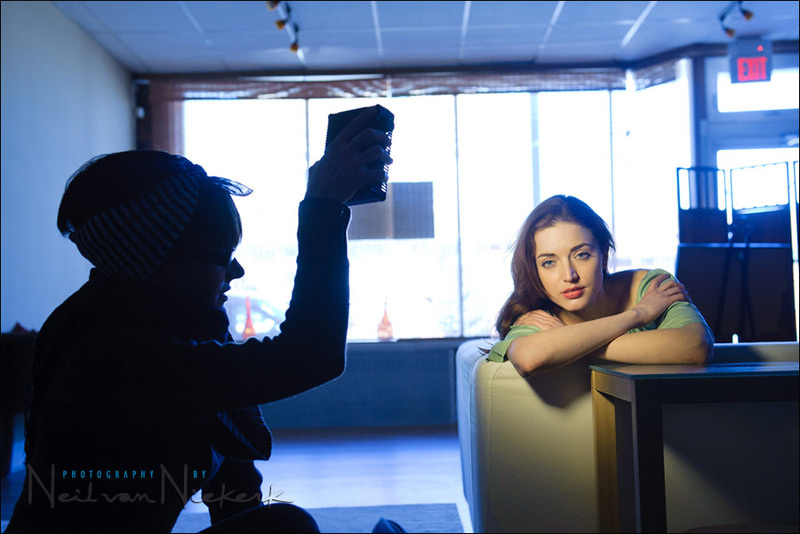 You didn’t mention it in under “differences in color temperature”, but do you think the one with the litepanels seems greenish? I just want to confirm what I see. Leo .. it does appear a touch more green in comparison to the Lowel ID-light. With post-processing, it wouldn’t be a problem in my opinion. It’s close enough to the color balance of the incandescent light that you shouldn’t even notice it in normal use. Thanks again Neil, for taking the time to do this review! I’ve been thinking about getting into video lighting, but I haven’t had much time lately to research and this is a great starting point! 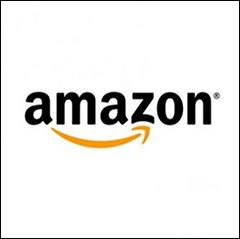 Hi, thanks for the great review and info! I asked you about the releveant differences between the Lowel id and the Litepanel in a previous post and you said then you planned to do some tests in the near future. Just wanted to say thanks very much for the excellent work you have done I found it very informative and interesting. Neil, I have a “cheap” LED light that I bought on ebay for around $45. It’s supposed to be equivalent to the LitePanels. It works fine but if I gel it, it will introduce a very strong green cast (around +55 tint adjustment in Lightroom 3). This of course makes it unusable. I have tried the filter that came with it as well as bought some Rosco CTS both with the same result. I don’t understand how this can happen because when not using filters, the tint is just fine. 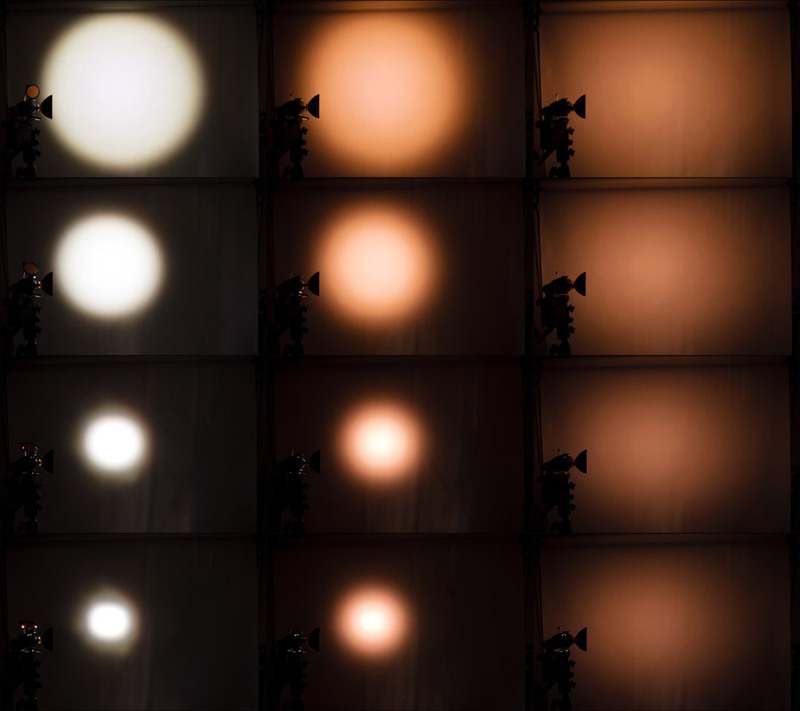 Will upgrading to the LitePanels allow me to use the filters without introducing any green cast? It is pretty big investment so I’d really like to know before commiting myself. Thanks! I’ve just bought a couple of LED panels to experiment with. The CN-160 by Nanguang, a very cheap unit, around £30. It seems to be well built and takes AA cells as well as camcorder batteries. At full-power, the light was fine for around an hour, then it slowly dimmed up to around 3 hours where it was too dim to be useful. The colour is around 5800K with a pretty good spectrum. There is an included diffuser and orange gel (which is way too orange). I can get ISO1600 F4 1/60th at 2 metres with the diffuser attached. The spread of light seems enough to cover a 28mm lens on a D3 with some falloff with the diffuser on. 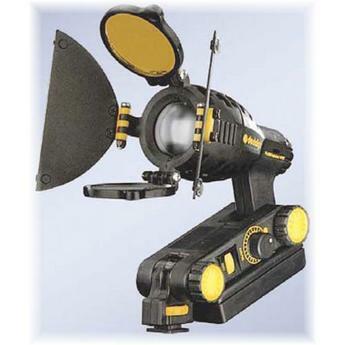 The Walimex pro VL-256 LED video light. This unit was around £180. 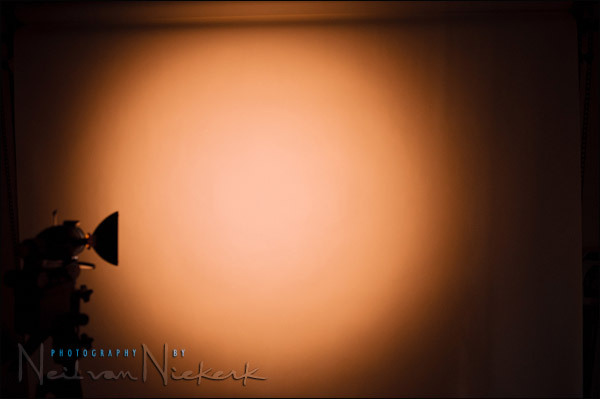 It comes with a diffuser and an orange filter (which matches incandescent sources very well). The temperature is around 5600K. It is about a stop brighter than the small Chinese unit and has a better and more even spread of light. It is shaped like a small strip box (quite wide). The spectrum is excellent (CRI of 85) and the D3 worked fine on AWB (with the usual slight blue tint that the D3 gives in daylight). The battery is a Sony camcorder battery, I haven’t tested it to extinguisher point yet but at least an hour on full with constant bright light. I bought these lights as I was unhappy with some of my “first Dance” and Table shots using bounced flash (I hate direct flash). I’m planning to use the Walimex on-camera and balanced to give some light to the couple while keeping the “disco” lighting in the background. I’m excited about the way LED technology is moving with much better spectrum output and some units have controllable Kelvin. The Walimex is almost too bright to look directly at, so flash still has its place for the majority of my work but the portability and the use as a teaching aid, I believe, will be invaluable. Love the lowel ID light, bought it from B&H with a Bescore battery. Thanks for the review! I have a question about video lights, and I thought I’d ask on this great article. I know you use the Lowel ID and the Litepanel MicroPro, as discussed above and I was wondering which you recommend for a night time photoshoot? The shoot idea would be of a bride outside a church where she’s lit by the video light and the church is just lit by ambient light. 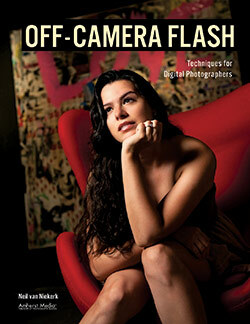 I may be over-thinking this and having an off-camera flash (Nikon SB900) may be enough. I think it is a good idea to have a video light as part of your lighting arsenal anyway, even if you rely mostly on flash.